KOCHI/THIRUVANATHAPURAM: Six passengers on board the flight from Abu Dhabi to Kochi, that was stranded at Thiruvananthapuram airport for nine hours, have been detained for questioning at the Kochi airport, according to Times Now. Meanwhile, the Kerala government has decided to conduct a detailed probe into the hijack drama and has asked the state director general of police to submit a report at the earliest. DGP has been asked to inquire into the complaints raised by the passengers and the Air India pilot. 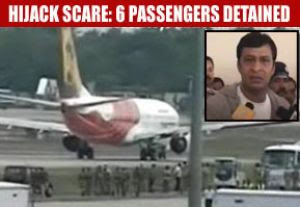 There was high drama at the airport on Friday morning as pilot of the Air India Express flight 4422, from Abu Dhabi to Kochi, sent out a hijack alert trigerring alarm. The pilot claimed that he took the extreme step after some passengers reportedly tried to force their way into the cockpit. The passengers, however, denied this charge. According to reports, the passengers were angry as the flight, which was coming from Abu Dhabi, was diverted here at the last minute. The flight, which took off from Abu Dhabi at 12.30am and was supposed to land in Kochi at 3.30am, was stranded at Thuiruvananthapuram for over nine hours and finally took off for Kochi at 2pm on Friday. The Airport Authority of India and the ATC put the airport on alert after the pilot of flight 4422 from Abu Dhabi to Kochi send out a hijack message in the morning. According to reports, the pilot said that the passengers on the aircraft were creating trouble. Speaking to Times Now, the passengers said that there was a heated debate at the door of the cockpit, but no one tried to enter it. The passengers complained that they have been waiting for the aircraft to fly since 3.30am in the night. The air conditioning iniside the aircraft is not working causing trouble to the passengers. The passengers also complained that they were not even served food and water.